When IRON COUNCIL ends, it brings both THE SCAR and PERDIDO STREET STATION to a close with it. The third and final book in China Mieville’s Bas-Lab trilogy picks up a buried theme in the previous two installments and runs wild with it. Looking back, all three books were about history—how it’s made, how meaning is made from it, how much of what really happens goes unknown and undocumented—but IRON COUNCIL puts this theme front and center. The eponymous Iron Council is a small society of mutinous railroad workers. Years ago, they hijacked a train bound to connect New Crobuzon and other major cities and rode it into the wilderness, laying track as they went and picking it up behind them. The Iron Councillors are anarchists, living collectively, living in rapt defiance of where they come from, and back in New Crobuzon they are a symbol of hope that sometimes the poor and downtrodden win. IRON COUNCIL is a split narrative that follows Judah Low*, a golemist who helps create the Iron Council in the first place; Cutter, a wounded cynic whose desperate love for Judah Low drives him into the center of things; and Ori, a young radical caught up in things he doesn’t understand back in New Crobuzon. ** This is a big book, full of plot. There is a war, and an uprising, and vigilante justice, and a secret spy, and a strange monk who goes missing in pieces. All of the plot gravitates around the turmoil in New Crobuzon and the role the Iron Council plays in that—both as a catalytic symbol and as a group of real people who must decide to return to the city or keep running from it. IRON COUNCIL is a deeply political book. It seems very clear to me that Mieville’s own politics seeped through to the pages here, that there is perhaps more of him in this book than in other ones. Having been in radical politics, I recognized a lot of the underground and fringe elements: arguments about the pitch and tenor of the paper, debates on the efficacy of guerrilla actions versus collective decisions that spun around and around. And in many ways, this is Mieville’s most utopian novel, too. He takes care to paint the Iron Councillors as real people grappling with real struggles, and they are not perfect. But he writes them with such love and admiration that it’s impossible not to get swept up in the romance and potential of their lives and actions. Years might pass and we will tell the story of the Iron Council and how it was made, how it made itself and went, and how it came back, and is coming, is still coming. But if the Iron Council never arrives, if it’s always a potential and never a reality, then is what it brings a false hope? What is the role of history? How should it guide us? Is it better to freeze things before they have a chance to fail with the idea that they could have succeeded rather than let it play out and deal with the trauma of a defeat? The book doesn’t answer these questions, only dredges them up. Judah, Cutter and Ori all have very different perspectives on these ideas, on the role of ideas in praxis to begin with. I have kept chewing over all these questions for weeks after I finished the book. To call IRON COUNCIL thought-provoking is an understatement. *I see what you did there with that name, China Mieville. **It is a very male-centric book. There is a secondary character, Ann-Hari, who I adored. She had all the agency I wanted Bellis Coldwine in THE SCAR to have. Ann-Hari starts as a whore, and emerges as a leader, first among the whores (with whom she organizes strikes) and then as a prominent and influential figure in the Iron Council itself. Though we meet her and know her first as a love interest of Judah’s, she quickly becomes much more than that and exists as herself outside of that relationship. The end to her story, more than anyone else’s, was deeply affecting and horrifically tragic. It’s worth reading this book for her alone, but I couldn’t help but wish she had been moved to the forefront. 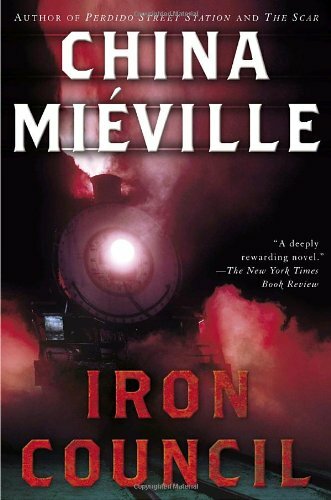 This entry was posted in 4 stars, Book Review and tagged 4 stars, bas-lag, book review, China Mieville, iron council by brsanders. Bookmark the permalink.